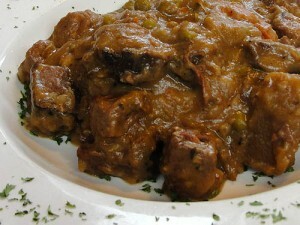 Delish Beef Stew recipe by The Skinny Cook at DesiRecipes.com. Put one onion , garlic , ginger , paprika, chili powder, cumin, coriander, yogurt and salt in the foodprocessor. Process until mixture is smooth. Heat oil in a large pan. Fry the remaining onion until just soft. Add the meat and fry until it is well coated and starts to brown. If you use a crock pot, put all in the crock pot now. Simmer, covered, for 1 hour or until the meat is tender. I loved it. But after I browned the meat I added tomatoes.